When given an affordable option, who wouldn’t love to trade energy–inefficient present-day dwellings for a more energy-efficient ecoliving lifestyle? That said, the reality is that the average hard-working home buyer – when making what may be, one of the most expensive purchasing decisions of their entire life – is most likely to find more conventional, rectilinear (straight-line) home construction methods vs. curvilinear (rounded) geodesic dome construction; thus, remaining totally unaware of a dome’s many structural energy-efficient cost-saving advantages. This dome is in harmony with Nature, both in construction and in the Swiss Alp location. Requiring 30% less energy to circulate air, the curvilinear geodesic design maintains moderate air temperatures by facilitating constant airflow within the energy-efficient ecoliving dome structure. Fueled by human-caused environmental impact concerns, forward-thinking individuals are beginning to reverse the trend towards unsustainable human habitats. The Buckminster Fuller Institute (BFI) is advancing the future vision of responsible earth stewardship through ongoing education. And, yes, we’re beginning to see some positive trends towards energy-efficient ecoliving (aka green building) architecture and construction. This 20′ dome home has a rammed earth floor, and the veggie and flower garden also serves as landscaping. 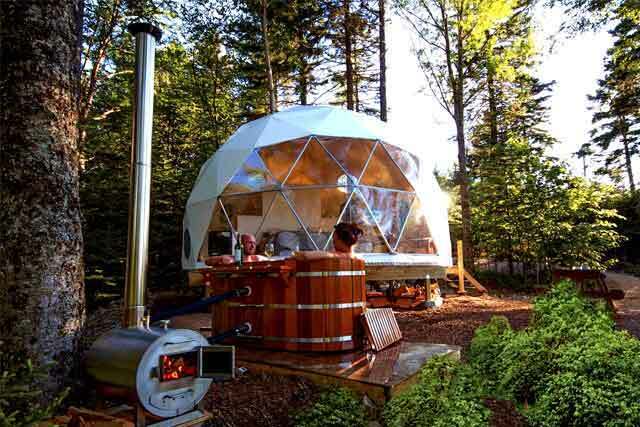 Made popular through the pioneering efforts of geodesic dome manufacturers, like Pacific Domes, a portable, prefab Dwell Dome is an insurance policy in itself! Some irrefutable facts behind this bold statement are the ongoing reports of a geodesic dome being the only structure left standing following the aftermath of one of Nature’s extremes, such as a hurricane, tornado or earthquake. Geodesic domes are composed of inter-connected triangles that lend superior structural strength. Father of the modern geodesic dome, Buckminster ‘Bucky’ Fuller, demonstrated the difference in strength between rectangles and triangles by applying pressure to both structures… the triangle proved to be twice as strong and remained rigid, while the unstable rectangle collapsed. 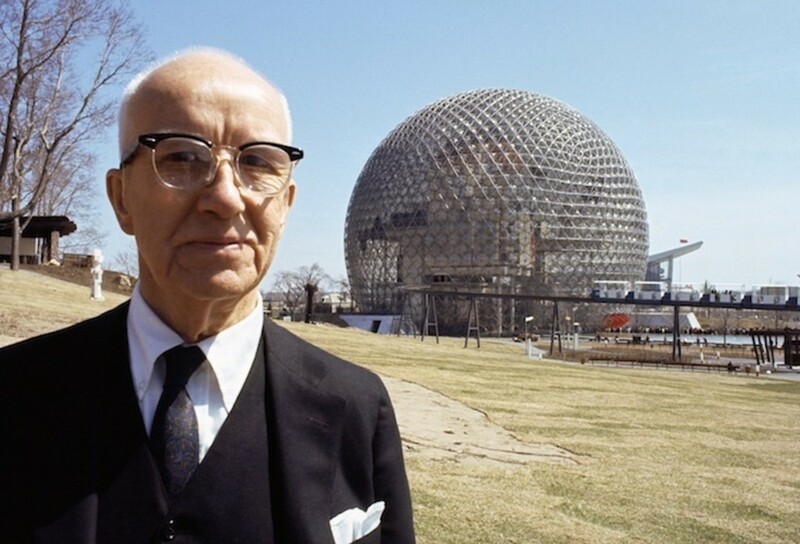 Buckminster Fuller won an award from the American Architectural Society for inventing the strongest structure known to man. Citing this well-documented information, accompanied by a good set of engineering blueprints, will facilitate in getting your plans approved by building departments. Providing durable and long-lasting shelter in all types of climates – from tropical beaches to snowy-mountains – from wind-swept deserts to humid rainforests, Pacific Domes covers are made of 20-year outdoor architectural fabric (UV shield & mildew resistant). A key consideration in choosing fabric for your domes is longevity. The 2 main causes of deterioration are UV (sun damage) and mildew. 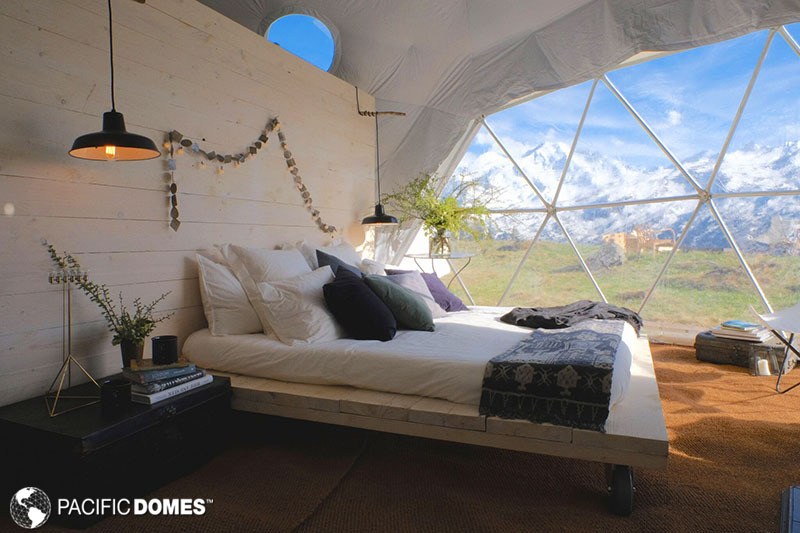 Even in the harshest winter conditions, such as, Antarctica, Pacific Domes provides several options to transform your dome into a cozy refuge. In high moisture areas, SunLite™ and SunShield™ (vinyl) fabrics afford a smooth easy-to-clean smooth surface that’s mold and mildew resistant. In desert-like areas, adding a coat of Thermoshield™ protection to a SunLite™ cover, will dramatically extend the its life expectancy. If you’ve dreamt of having a more harmonious close-to-nature lifestyle, erecting your own geodesic Dwell Dome house might be the perfect energy-efficient ecoliving solution you’ve been searching for. Additionally, you’ll avoid the headaches of starting completely from scratch, by building with a portable Prefab Geodesic-Engineered Building System by Pacific Domes!